VATICAN CITY (CNS) – Cardinal Lorenzo Baldisseri, general secretary of the Synod of Bishops, introduced the work of the synod on young people Oct. 3 with a variety of statistics and informational notes. He told the gathering that the 267 voting members of the synod include: 51 cardinals (including two patriarchs and three major archbishops of Eastern Catholic churches); four other patriarchs of Eastern Catholic churches; the major archbishop of the Ukrainian Catholic Church; 45 archbishops; 102 diocesan bishops; 37 auxiliary bishops; six apostolic vicars; one bishop prelate; eight religious-order priests and two religious brothers representing the Union of Superiors General; and 10 diocesan and religious-order priests nominated by Pope Francis. The synod’s working document was prepared with input from an online questionnaire for young people, responses from bishops’ conferences around the world and the results of a presynod meeting of young adults in March. More than 220,000 people accessed the online questionnaire the Synod of Bishops’ office had active in June-December 2017, the cardinal said. Just over 100,000 people ages 16-29 — 58,000 young women and 42,500 young men — completed the survey. Just over 50 percent of the respondents were 16-19 years old, he said. And more than 16,000 of the completed questionnaires originated with users in Uganda, making it the country with the highest response rate. The preparatory document for the synod was released in January 2017 and included a series of questions to be answered by national bishops’ conferences or bishops’ synods of the Eastern Catholic churches and by the offices of the Roman Curia. Cardinal Baldisseri said 40 percent of the Eastern churches and 68.4 percent of the bishops’ conferences responded. The rate is low for a synod. 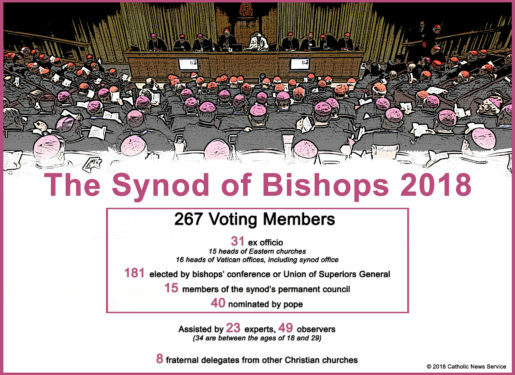 For the first assembly of the Synod of Bishops on the family in 2014, more than 80 percent of bishops’ conferences responded; for the 2012 synod on new evangelization, the synod office had reported that 81.5 percent of the conferences responded. The general sessions in each of the first three weeks of the synod are devoted to one section of the three-part working document, Cardinal Baldisseri explained. Each voting member of the synod is allowed to address the general session only once and only for four minutes. His remarks must refer to the section of the working document being discussed that week. In addition, at each working session, one of the 34 synod of observers who is between the ages of 18 and 29 will speak. Continuing a practice begun by Pope Benedict XVI, the evening sessions of the synod end with one hour of “free discussion.” Again, each synod member may speak for no more than four minutes. The 12 sessions of the synod’s working groups are where members can shake off those time limits and where experts, observers and the eight fraternal delegates from other Christian churches also are free to speak. The synod participants will be divided into 14 working groups according to language: French, Italian, English, Portuguese, Spanish or German. Although the groups are commonly referred to by their Latin name – “circuli minores” – there no longer is a Latin-language small group at the synod. In accordance with new rules published just before the synod, participants will not be working on “propositions” to submit to Pope Francis, but on “amendments” to the synod’s working document with a view of transforming it into a final document to be submitted to the pope. Pope Francis will decide whether it can be published, and he can decide whether to adopt it as his own teaching.